Philly artist Tierra Whack wore a Philly designer on the red carpet at the Grammy awards on Sunday. 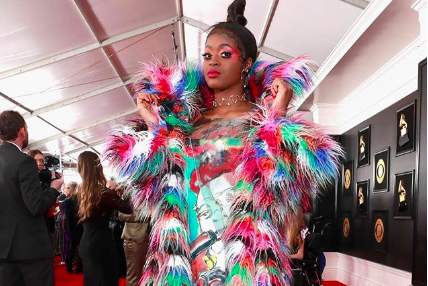 Rapper, singer and songwriter Tierra Whack showed up to the Grammy Awards wearing a Philly designer. The dress, which got a lot of red-carpet buzz during the ceremony on social media, was designed by Drexel alumna Nancy Beringer. “The dress actually – if you can’t really see it – has a lot of layers and movements so as she moves the image changes. It really represents her creativity, as well as my creativity,” Beringer told CBS. The print for the dress also was designed by Philly painter, graphic artist Liz Goldberg. According to Nancy Beringer on Instagram, its originally was created as part of Goldberg's "Cuban Queens" series. The dress is fitting for the always-surprising 22-year-old Philly rapper, who has built a solid following (in Philly and beyond) from her bold choices in music and aesthetic. Whack was nominated for Best Music Video for her single "Mumbo Jumbo" that she released in October 2017. She went on to release her experimental vocal and visual album, "Whack World," in 2018, which is only 15 minutes in length.